Thirteen percent of the world’s oceans is considered marine wilderness—crucial areas of water mostly undisturbed by humans where biodiversity is able to flourish. Much is known about human impact on land wilderness, but until recently, less has been known about how human activity and climate change have affected marine vitality. In a study published Thursday in Current Biology, researchers have determined that marine wilderness accounts for only 13 percent—some 34 million square kilometers—of the ocean. Marine wilderness is area that has experienced low or no human disturbance. 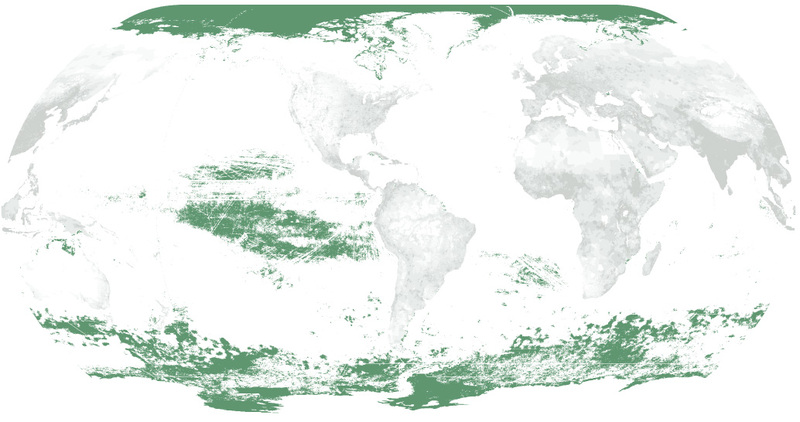 Perhaps unsurprisingly, the highest concentrations of marine wilderness are found far away from typical human reach: in the high seas and less-populated southern hemisphere. Coastal areas contain only 10 percent of marine wilderness. Only five percent of wilderness is in internationally protected areas. While that pattern is predictable, Kendall Jones, lead author and conservation planning specialist at the Wildlife Conservation Society, said he expected to find more wilderness. He attributes some of the result to a growing fishing industry continually pushing its own physical boundaries. “Fishing is the most significant way in which humans impact the ocean,” he said. Marine wilderness congregates at the poles as well, where sea ice has made it relatively inaccessible to humans. But as sea ice melts, Jones and his team believe those areas may become more vulnerable to human and climate stressors. Researchers looked at 15 human-made stressors, like fishing, pollution and nutrient runoff, as well as four climate change-related ones, like ocean acidification, and determined the areas with the lowest impact. Marine wilderness tends to have more biological and genetic diversity than other areas. These areas can be more resilient to the effects of climate change and can show us what areas of the globe looked like before human intervention, though it’s unlikely they will ever be fully restored, Jones said.